The title supergiant, as applied to a star, does not have a single concrete definition. The term giant star was first coined by Hertzsprung when it became apparent that the majority of stars fell into two distinct regions of the Hertzsprung–Russell diagram. One region contained larger and more luminous stars of spectral types A to M and received the name giant. Subsequently, as they lacked any measurable parallax, it became apparent that some of these stars were significantly larger and more luminous than the bulk, and the term super-giant arose, quickly adopted as supergiant. Supergiant stars can be identified on the basis of their spectra, with distinctive lines sensitive to high luminosity and low surface gravity. In 1897, Antonia C. Maury had divided stars based on the widths of their spectral lines, with her class "c" identifying stars with the narrowest lines. Although it was not known at the time, these were the most luminous stars. In 1943 Morgan and Keenan formalised the definition of spectral luminosity classes, with class I referring to supergiant stars. The same system of MK luminosity classes is still used today, with refinements based on the increased resolution of modern spectra. Supergiants occur in every spectral class from young blue class O supergiants to highly evolved red class M supergiants. Because they are enlarged compared to main-sequence and giant stars of the same spectral type, they have lower surface gravities, and changes can be observed in their line profiles. Supergiants are also evolved stars with higher levels of heavy elements than main-sequence stars. This is the basis of the MK luminosity system which assigns stars to luminosity classes purely from observing their spectra. In addition to the line changes due to low surface gravity and fusion products, the most luminous stars have high mass-loss rates and resulting clouds of expelled circumstellar materials which can produce emission lines, P Cygni profiles, or forbidden lines. The MK system assigns stars to luminosity classes: Ib for supergiants; Ia for luminous supergiants; and 0 (zero) or Ia+ for hypergiants. In reality there is much more of a continuum than well defined bands for these classifications, and classifications such as Iab are used for intermediate luminosity supergiants. Supergiant spectra are frequently annotated to indicate spectral peculiarities, for example B2 Iae or F5 Ipec. Supergiants can also be defined as a specific phase in the evolutionary history of certain stars. Stars with initial masses above 8-10 M☉ quickly and smoothly initiate helium core fusion after they have exhausted their hydrogen, and continue fusing heavier elements after helium exhaustion until they develop an iron core, at which point the core collapses to produce a Type 2 supernova. Once these massive stars leave the main sequence, their atmospheres inflate, and they are described as supergiants. Stars initially under 10 M☉ will never form an iron core and in evolutionary terms do not become supergiants, although they can reach luminosities thousands of times the sun's. They cannot fuse carbon and heavier elements after the helium is exhausted, so they eventually just lose their outer layers, leaving the core of a white dwarf. The phase where these stars have both hydrogen and helium burning shells is referred to as the asymptotic giant branch (AGB), as stars gradually become more and more luminous class M stars. Stars of 8-10 M☉ may fuse sufficient carbon on the AGB to produce an oxygen-neon core and an electron-capture supernova, but astrophysicists categorise these as super-AGB stars rather than supergiants. There are several categories of evolved stars which are not supergiants in evolutionary terms but may show supergiant spectral features or have luminosities comparable to supergiants. Asymptotic-giant-branch (AGB) and post-AGB stars are highly evolved lower-mass red giants with luminosities that can be comparable to more massive red supergiants, but because of their low mass, being in a different stage of development (helium shell burning), and their lives ending in a different way (planetary nebula and white dwarf rather than supernova), astrophysicists prefer to keep them separate. The dividing line becomes blurred at around 7–10 M☉ (or as high as 12 M☉ in some models) where stars start to undergo limited fusion of elements heavier than helium. Specialists studying these stars often refer to them as super AGB stars, since they have many properties in common with AGB such as thermal pulsing. Others describe them as low-mass supergiants since they start to burn elements heavier than helium and can explode as supernovae. Many post-AGB stars receive spectral types with supergiant luminosity classes. For example, RV Tauri has an Ia (bright supergiant) luminosity class despite being less massive than the sun. Some AGB stars also receive a supergiant luminosity class, most notably W Virginis variables such as W Virginis itself, stars that are executing a blue loop triggered by thermal pulsing. A very small number of Mira variables and other late AGB stars have supergiant luminosity classes, for example α Herculis. Classical Cepheid variables typically have supergiant luminosity classes, although only the most luminous and massive will actually go on to develop an iron core. The majority of them are intermediate mass stars fusing helium in their cores and will eventually transition to the asymptotic giant branch. δ Cephei itself is an example with a luminosity of 2,000 L☉ and a mass of 4.5 M☉. Wolf–Rayet stars are also high-mass luminous evolved stars, hotter than most supergiants and smaller, visually less bright but often more luminous because of their high temperatures. They have spectra dominated by helium and other heavier elements, usually showing little or no hydrogen, which is a clue to their nature as stars even more evolved than supergiants. Just as the AGB stars occur in almost the same region of the HR diagram as red supergiants, Wolf–Rayet stars can occur in the same region of the HR diagram as the hottest blue supergiants and main-sequence stars. The most massive and luminous main-sequence stars are almost indistinguishable from the supergiants they quickly evolve into. They have almost identical temperatures and very similar luminosities, and only the most detailed analyses can distinguish the spectral features that show they have evolved away from the narrow early O-type main-sequence to the nearby area of early O-type supergiants. Such early O-type supergiants share many features with WNLh Wolf–Rayet stars and are sometimes designated as slash stars, intermediates between the two types. Luminous blue variables (LBVs) stars occur in the same region of the HR diagram as blue supergiants but are generally classified separately. They are evolved, expanded, massive, and luminous stars, often hypergiants, but they have very specific spectral variability, which defies the assignment of a standard spectral type. LBVs observed only at a particular time or over a period of time when they are stable, may simply be designated as hot supergiants or as candidate LBVs due to their luminosity. Hypergiants are frequently treated as a different category of star from supergiants, although in all important respects they are just a more luminous category of supergiant. They are evolved, expanded, massive and luminous stars like supergiants, but at the most massive and luminous extreme, and with particular additional properties of undergoing high mass-loss due to their extreme luminosities and instability. Generally only the more evolved supergiants show hypergiant properties, since their instability increases after high mass-loss and some increase in luminosity. Some B[e] stars are supergiants although other B[e] stars are clearly not. Some researchers distinguish the B[e] objects as separate from supergiants, while researchers prefer to define massive evolved B[e] stars as a subgroup of supergiants. The latter has become more common with the understanding that the B[e] phenomenon arises separately in a number of distinct types of stars, including some that are clearly just a phase in the life of supergiants. Supergiants have masses from 8 to 12 times the Sun (M☉) upwards, and luminosities from about 1,000 to over a million times the Sun (L☉). They vary greatly in radius, usually from 30 to 500, or even in excess of 1,000 solar radii (R☉). They are massive enough to begin helium-core burning gently before the core becomes degenerate, without a flash and without the strong dredge-ups that lower-mass stars experience. They go on to successively ignite heavier elements, usually all the way to iron. Also because of their high masses, they are destined to explode as supernovae. The Stefan-Boltzmann law dictates that the relatively cool surfaces of red supergiants radiate much less energy per unit area than those of blue supergiants; thus, for a given luminosity, red supergiants are larger than their blue counterparts. Radiation pressure limits the largest cool supergiants to around 1,500–2,600 R☉ and the most massive hot supergiants to around a million L☉ (Mbol around −10). Stars near and occasionally beyond these limits become unstable, pulsate, and experience rapid mass loss. The supergiant luminosity class is assigned on the basis of spectral features that are largely a measure of surface gravity, although such stars are also affected by other properties such as microturbulence. Supergiants typically have surface gravities of around log(g) 2.0 cgs and lower, although bright giants (luminosity class II) have statistically very similar surface gravities to normal Ib supergiants. Cool luminous supergiants have lower surface gravities, with the most luminous (and unstable) stars having log(g) around zero. Hotter supergiants, even the most luminous, have surface gravities around one, due to their higher masses and smaller radii. There are supergiant stars at all of the main spectral classes and across the whole range of temperatures from mid-M class stars at around 3,000–3,450 K to the hottest O class stars over 40,000 K. Supergiants are generally not found cooler than mid-M class. This is expected theoretically since they would be catastrophically unstable; however, there are potential exceptions among extreme stars such as VX Sagittarii. Although supergiants exist in every class from O to M, the majority are spectral type B, more than at all other spectral classes combined. A much smaller grouping consists of very low-luminosity G-type supergiants, intermediate mass stars burning helium in their cores before reaching the asymptotic giant branch. A distinct grouping is made up of high-luminosity supergiants at early B (B0-2) and very late O (O9.5), more common even than main sequence stars of those spectral types. The relative numbers of blue, yellow, and red supergiants is an indicator of the speed of stellar evolution and is used as a powerful test of models of the evolution of massive stars. 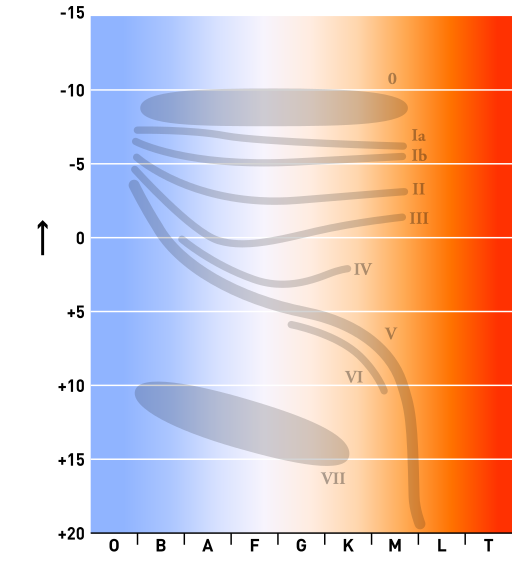 The supergiants lie more or less on a horizontal band occupying the entire upper portion of the HR diagram, but there are some variations at different spectral types. These variations are due partly to different methods for assigning luminosity classes at different spectral types, and partly to actual physical differences in the stars. The bolometric luminosity of a star reflects its total output of electromagnetic radiation at all wavelengths. For very hot and very cool stars, the bolometric luminosity is dramatically higher than the visual luminosity, sometimes several magnitudes or a factor of five or more. This bolometric correction is approximately one magnitude for mid B, late K, and early M stars, increasing to three magnitudes (a factor of 15) for O and mid M stars. All supergiants are larger and more luminous than main sequence stars of the same temperature. This means that hot supergiants lie on a relatively narrow band above bright main sequence stars. A B0 main sequence star has an absolute magnitude of about −5, meaning that all B0 supergiants are significantly brighter than absolute magnitude −5. Bolometric luminosities for even the faintest blue supergiants are tens of thousands of times the sun (L☉). The brightest can be over a million L☉ and are often unstable such as α Cygni variables and luminous blue variables. The very hottest supergiants with early O spectral types occur in an extremely narrow range of luminosities above the highly luminous early O main sequence and giant stars. They are not classified separately into normal (Ib) and luminous (Ia) supergiants, although they commonly have other spectral type modifiers such as "f" for nitrogen and helium emission (e.g. O2 If for HD 93129A). Yellow supergiants can be considerably fainter than absolute magnitude −5, with some examples around −2 (e.g. 14 Persei). With bolometric corrections around zero, they may only be a few hundred times the luminosity of the sun. These are not massive stars, though; instead, they are stars of intermediate mass that have particularly low surface gravities, often due to instability such as Cepheid pulsations. These intermediate mass stars' being classified as supergiants during a relatively long-lasting phase of their evolution account for the large number of low luminosity yellow supergiants. The most luminous yellow stars, the yellow hypergiants, are amongst the visually brightest stars, with absolute magnitudes around −9, although still less than a million L☉. There is a strong upper limit to the luminosity of red supergiants at around half a million L☉. Stars that would be brighter than this shed their outer layers so rapidly that they remain hot supergiants after they leave the main sequence. The majority of red supergiants were 10-15 M☉ main sequence stars and now have luminosities below 100,000 L☉, and there are very few bright supergiant (Ia) M class stars. The least luminous stars classified as red supergiants are some of the brightest AGB and post-AGB stars, highly expanded and unstable low mass stars such as the RV Tauri variables. The majority of AGB stars are given giant or bright giant luminosity classes, but particularly unstable stars such as W Virginis variables may be given a supergiant classification (e.g. W Virginis itself). The faintest red supergiants are around absolute magnitude −3. RS Puppis is a supergiant and Classical Cepheid variable. While most supergiants such as Alpha Cygni variables, semiregular variables, and irregular variables show some degree of photometric variability, certain types of variables amongst the supergiants are well defined. The instability strip crosses the region of supergiants, and specifically many yellow supergiants are Classical Cepheid variables. The same region of instability extends to include the even more luminous yellow hypergiants, an extremely rare and short-lived class of luminous supergiant. Many R Coronae Borealis variables, although not all, are yellow supergiants, but this variability is due to their unusual chemical composition rather than a physical instability. Further types of variable stars such as RV Tauri variables and PV Telescopii variables are often described as supergiants. RV Tau stars are frequently assigned spectral types with a supergiant luminosity class on account of their low surface gravity, and they are amongst the most luminous of the AGB and post-AGB stars, having masses similar to the sun; likewise, the even rarer PV Tel variables are often classified as supergiants, but have lower luminosities than supergiants and peculiar B[e] spectra extremely deficient in hydrogen. Possibly they are also post-AGB objects or "born-again" AGB stars. The LBVs are variable with multiple semi-regular periods and less predictable eruptions and giant outbursts. They are usually supergiants or hypergiants, occasionally with Wolf-Rayet spectra—extremely luminous, massive, evolved stars with expanded outer layers, but they are so distinctive and unusual that they are often treated as a separate category without being referred to as supergiants or given a supergiant spectral type. Often their spectral type will be given just as "LBV" because they have peculiar and highly variable spectral features, with temperatures varying from about 8,000 K in outburst up to 20,000 K or more when "quiescent." The abundance of various elements at the surface of supergiants is different from less luminous stars. Supergiants are evolved stars and may have undergone convection of fusion products to the surface. Cool supergiants show enhanced helium and nitrogen at the surface due to convection of these fusion products to the surface during the main sequence of very massive stars, to dredge-ups during shell burning, and to the loss of the outer layers of the star. Helium is formed in the core and shell by fusion of hydrogen and nitrogen which accumulates relative to carbon and oxygen during CNO cycle fusion. At the same time, carbon and oxygen abundances are reduced. Red supergiants can be distinguished from luminous but less massive AGB stars by unusual chemicals at the surface, enhancement of carbon from deep third dredge-ups, as well as carbon-13, lithium and s-process elements. Late-phase AGB stars can become highly oxygen-enriched, producing OH masers. Hotter supergiants show differing levels of nitrogen enrichment. This may be due to different levels of mixing on the main sequence due to rotation or because some blue supergiants are newly evolved from the main sequence while others have previously been through a red supergiant phase. Post-red supergiant stars have a generally higher level of nitrogen relative to carbon due to convection of CNO-processed material to the surface and the complete loss of the outer layers. Surface enhancement of helium is also stronger in post-red supergiants, representing more than a third of the atmosphere. O type main-sequence stars and the most massive of the B type blue-white stars become supergiants. Due to their extreme masses, they have short lifespans, between 30 million years and a few hundred thousand years. They are mainly observed in young galactic structures such as open clusters, the arms of spiral galaxies, and in irregular galaxies. They are less abundant in spiral galaxy bulges and are rarely observed in elliptical galaxies, or globular clusters, which are composed mainly of old stars. Supergiants develop when massive main-sequence stars run out of hydrogen in their cores, at which point they start to expand, just like lower-mass stars. Unlike lower-mass stars, however, they begin to fuse helium in the core smoothly and not long after exhausting their hydrogen. This means that they do not increase their luminosity as dramatically as lower-mass stars, and they progress nearly horizontally across the HR diagram to become red supergiants. Also unlike lower-mass stars, red supergiants are massive enough to fuse elements heavier than helium, so they do not puff off their atmospheres as planetary nebulae after a period of hydrogen and helium shell burning; instead, they continue to burn heavier elements in their cores until they collapse. They cannot lose enough mass to form a white dwarf, so they will leave behind a neutron star or black hole remnant, usually after a core collapse supernova explosion. Stars more massive than about 40 M☉ cannot expand into a red supergiant. Because they burn too quickly and lose their outer layers too quickly, they reach the blue supergiant stage, or perhaps yellow hypergiant, before returning to become hotter stars. The most massive stars, above about 100 M☉, hardly move at all from their position as O main-sequence stars. These convect so efficiently that they mix hydrogen from the surface right down to the core. They continue to fuse hydrogen until it is almost entirely depleted throughout the star, then rapidly evolve through a series of stages of similarly hot and luminous stars: supergiants, slash stars, WNh-, WN-, and possibly WC- or WO-type stars. They are expected to explode as supernovae, but it is not clear how far they evolve before this happens. The existence of these supergiants still burning hydrogen in their cores may necessitate a slightly more complex definition of supergiant: a massive star with increased size and luminosity due to fusion products building up, but still with some hydrogen remaining. The first stars in the universe are thought to have been considerably brighter and more massive than the stars in the modern universe. Part of the theorized population III of stars, their existence is necessary to explain observations of elements other than hydrogen and helium in quasars. Possibly larger and more luminous than any supergiant known today, their structure was quite different, with reduced convection and less mass loss. Their very short lives are likely to have ended in violent photodisintegration or pair instability supernovae. Most type II supernova progenitors are thought to be red supergiants, while the less common type Ib/c supernovae are produced by hotter Wolf–Rayet stars that have completely lost more of their hydrogen atmosphere. Almost by definition, supergiants are destined to end their lives violently. Stars large enough to start fusing elements heavier than helium do not seem to have any way to lose enough mass to avoid catastrophic core collapse, although some may collapse, almost without trace, into their own central black holes. The simple "onion" models showing red supergiants inevitably developing to an iron core and then exploding have been shown, however, to be too simplistic. The progenitor for the unusual type II Supernova 1987A was a blue supergiant, thought to have already passed through the red supergiant phase of its life, and this is now known to be far from an exceptional situation. Much research is now focused on how blue supergiants can explode as a supernova and when red supergiants can survive to become hotter supergiants again. Direct image of the star UY Scuti, a red supergiant which is one of the largest known stars. Supergiants are rare and short-lived stars, but their high luminosity means that there are many naked-eye examples, including some of the brightest stars in the sky. Rigel, the brightest star in the constellation Orion is a typical blue-white supergiant; Deneb is the brightest star in Cygnus, a white supergiant; Delta Cephei is the famous prototype Cepheid variable, a yellow supergiant; and Betelgeuse, Antares and UY Scuti are red supergiants. μ Cephei is one of the reddest stars visible to the naked eye and one of the largest in the galaxy. Rho Cassiopeiae, a variable, yellow hypergiant, is one of the most luminous naked-eye stars. ^ Russell, Henry Norris (1914). "Relations Between the Spectra and Other Characteristics of the Stars". Popular Astronomy. 22: 275. Bibcode:1914PA.....22..275R. ^ Henroteau, F. (1926). "An international co-operation for the photographic study of Cepheid variables". Popular Astronomy. 34: 493. Bibcode:1926PA.....34..493H. ^ Shapley, Harlow (1925). "S Doradus, a Super-giant Variable Star". Harvard College Observatory Bulletin. 814: 1. Bibcode:1925BHarO.814....1S. ^ Payne, Cecilia H.; Chase, Carl T. (1927). "The Spectrum of Supergiant Stars of Class F8". Harvard College Observatory Circular. 300: 1. Bibcode:1927HarCi.300....1P. ^ Pannekoek, A. (1937). "Surface gravity in supergiant stars". Bulletin of the Astronomical Institutes of the Netherlands. 8: 175. Bibcode:1937BAN.....8..175P. ^ Spitzer, Lyman (1939). "Spectra of M Supergiant Stars". Astrophysical Journal. 90: 494. Bibcode:1939ApJ....90..494S. doi:10.1086/144121. ^ Pannekoek, A. (1963). A history of Astronomy. Dover Publications. doi:10.1086/349775. ISBN 0486659941. ^ Gray, R. O.; Napier, M. G.; Winkler, L. I. (2001). "The Physical Basis of Luminosity Classification in the Late A-, F-, and Early G-Type Stars. I. Precise Spectral Types for 372 Stars". The Astronomical Journal. 121 (4): 2148. Bibcode:2001AJ....121.2148G. doi:10.1086/319956. ^ Van Loon, J. Th. (2006). "On the metallicity dependence of the winds from red supergiants and Asymptotic Giant Branch stars". Stellar Evolution at Low Metallicity: Mass Loss. 353: 211. arXiv:astro-ph/0512326. Bibcode:2006ASPC..353..211V. ^ Siess, L. (2006). "Evolution of massive AGB stars". Astronomy and Astrophysics. 448 (2): 717–729. Bibcode:2006A&A...448..717S. doi:10.1051/0004-6361:20053043. ^ Poelarends, A. J. T.; Herwig, F.; Langer, N.; Heger, A. (2008). "The Supernova Channel of Super‐AGB Stars". The Astrophysical Journal. 675: 614–625. arXiv:0705.4643. Bibcode:2008ApJ...675..614P. doi:10.1086/520872. ^ a b c Levesque, Emily M.; Massey, Philip; Olsen, K. A. G.; Plez, Bertrand; Josselin, Eric; Maeder, Andre; Meynet, Georges (2005). "The Effective Temperature Scale of Galactic Red Supergiants: Cool, but Not As Cool As We Thought". The Astrophysical Journal. 628 (2): 973. arXiv:astro-ph/0504337. Bibcode:2005ApJ...628..973L. doi:10.1086/430901. ^ Gray, R. O.; Graham, P. W.; Hoyt, S. R. (2001). "The Physical Basis of Luminosity Classification in the Late A-, F-, and Early G-Type Stars. II. Basic Parameters of Program Stars and the Role of Microturbulence". The Astronomical Journal. 121 (4): 2159. Bibcode:2001AJ....121.2159G. doi:10.1086/319957. ^ Clark, J. S.; Najarro, F.; Negueruela, I.; Ritchie, B. W.; Urbaneja, M. A.; Howarth, I. D. (2012). "On the nature of the galactic early-B hypergiants". Astronomy & Astrophysics. 541: A145. arXiv:1202.3991. Bibcode:2012A&A...541A.145C. doi:10.1051/0004-6361/201117472. ^ a b Sowell, J. R.; Trippe, M.; Caballero-Nieves, S. M.; Houk, N. (2007). "H-R Diagrams Based on the HD Stars in the Michigan Spectral Catalogue and the Hipparcos Catalog". The Astronomical Journal. 134 (3): 1089. Bibcode:2007AJ....134.1089S. doi:10.1086/520060. ^ Massey, Philip; Olsen, K. A. G. (2003). "The Evolution of Massive Stars. I. Red Supergiants in the Magellanic Clouds". The Astronomical Journal. 126 (6): 2867. arXiv:astro-ph/0309272. Bibcode:2003AJ....126.2867M. doi:10.1086/379558. ^ Sota, A.; Maíz Apellániz, J.; Walborn, N. R.; Alfaro, E. J.; Barbá, R. H.; Morrell, N. I.; Gamen, R. C.; Arias, J. I. (2011). "The Galactic O-Star Spectroscopic Survey. I. Classification System and Bright Northern Stars in the Blue-violet at R ~ 2500". The Astrophysical Journal Supplement. 193 (2): 24. arXiv:1101.4002. Bibcode:2011ApJS..193...24S. doi:10.1088/0067-0049/193/2/24. ^ Lançon, A.; Hauschildt, P. H.; Ladjal, D.; Mouhcine, M. (2007). "Near-IR spectra of red supergiants and giants". Astronomy and Astrophysics. 468: 205. arXiv:0704.2120. Bibcode:2007A&A...468..205L. doi:10.1051/0004-6361:20065824. ^ García-Hernández, D. A.; García-Lario, P.; Plez, B.; Manchado, A.; d'Antona, F.; Lub, J.; Habing, H. (2007). "Lithium and zirconium abundances in massive Galactic O-rich AGB stars". Astronomy and Astrophysics. 462 (2): 711. arXiv:astro-ph/0609106. Bibcode:2007A&A...462..711G. doi:10.1051/0004-6361:20065785. ^ Smartt, S. J.; Lennon, D. J.; Kudritzki, R. P.; Rosales, F.; Ryans, R. S. I.; Wright, N. (2002). "The evolutionary status of Sher 25 - Implications for blue supergiants and the progenitor of SN 1987A". Astronomy and Astrophysics. 391 (3): 979. arXiv:astro-ph/0205242. Bibcode:2002A&A...391..979S. doi:10.1051/0004-6361:20020829. ^ Georgy, C.; Saio, H.; Meynet, G. (2013). "The puzzle of the CNO abundances of α Cygni variables resolved by the Ledoux criterion". Monthly Notices of the Royal Astronomical Society: Letters. 439: L6. arXiv:1311.4744. Bibcode:2014MNRAS.439L...6G. doi:10.1093/mnrasl/slt165. ^ Richmond, Michael. "Stellar evolution on the main sequence". Retrieved 2006-08-24. ^ Sylvia Ekström; Cyril Georgy; Georges Meynet; Jose Groh; Anahí Granada (2013). "Red supergiants and stellar evolution". EAS Publications Series. 60: 31. arXiv:1303.1629. Bibcode:2013EAS....60...31E. doi:10.1051/eas/1360003. ^ Groh, Jose H.; Georges Meynet; Cyril Georgy; Sylvia Ekstrom (2013). "Fundamental properties of core-collapse Supernova and GRB progenitors: Predicting the look of massive stars before death". Astronomy & Astrophysics. 558: A131. arXiv:1308.4681. Bibcode:2013A&A...558A.131G. doi:10.1051/0004-6361/201321906. ^ Van Dyk, S. D.; Li, W.; Filippenko, A. V. (2003). "A Search for Core‐Collapse Supernova Progenitors in Hubble Space Telescope Images". Publications of the Astronomical Society of the Pacific. 115 (803): 1. arXiv:astro-ph/0210347. Bibcode:2003PASP..115....1V. doi:10.1086/345748. Tempesti, Piero, ed. (1979). Enciclopedia dell'Astronomia. Curcio.